i wish my hair grew out of my scalp this color! ha ha ha My little Alani and I both wish our hair was this color. I've had red hair before...it was pretty short, right below my ears....but I loved it! ha ha ha I should do a blog about all the different hair styles, cut and colors I've had! Right after I finished beauty school...I would change my hair color almost every month! 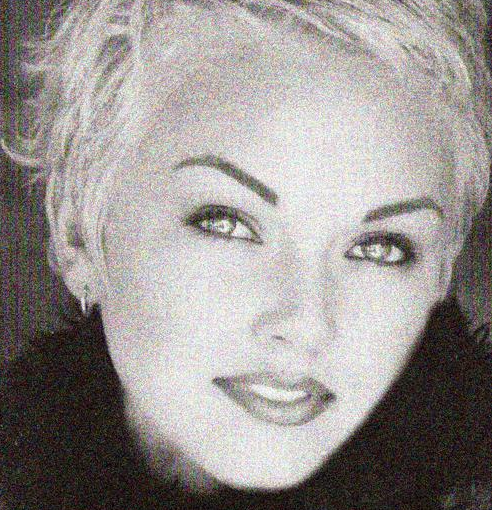 my platinum hair (AKA white..ha ha ha)...nad my super short cut was one of my favorites too! I'm feeling a new hair change coming up!!! Not sure what I want to do....but something fun! I dyed my hair that color (red, not platinum) twice and loved it soooooo much! I couldn't keep it though (yay for a professional work look), which was disappointing. If the chance came up, I would absolutely do it again! It does look amazing on you! i always wanted that color! wow i love red hair!! I love super red hair too! But I love jet black hair as well, so I dye my hair black and have a chunk of it that I'll dye it red,hot pink,purple, whatever color I'm in the mood for!! can't wait to see your new hair look!! I want red hair so bad !!!! I would love to dye my hair platinum! I'm just super afraid that it will damage it very badly. I have some of it underneath bleached and it seems really dry some of the time and it doesn't matter how much I condition it! I'm going red next Friday!!! I'm looking forward to seeing youre new style. Whatever you do it will look fabulous. What??? Am I the only one so far tht thinks you look like Sharon Stone in tht last pic?!!!! I have that blond pic, I cut it out to take to my beautician!! long before I knew of Kandee!!! I love it & I'm 68! Hi kandee, I love your videos. They are so helpful. I just purchased the Ben nye glam pallet and I was wondering if you could do some more tutorials with that pallet. Some day looks and some evening looks. I notice every time I use the grays it always makes me look dull. I have brown skin. Any suggestions on how to brighten my face without looking oily? I have really oily skin. Hope u respond to this post. Thank you! Yes!!! Go red!! Go red!!! So I just recently started watching your video on youtube and love em! && I've been looking at your blog and from some of the video that you do of celebrity's makeup, I would love to see you to an Audrey Hepburn look!